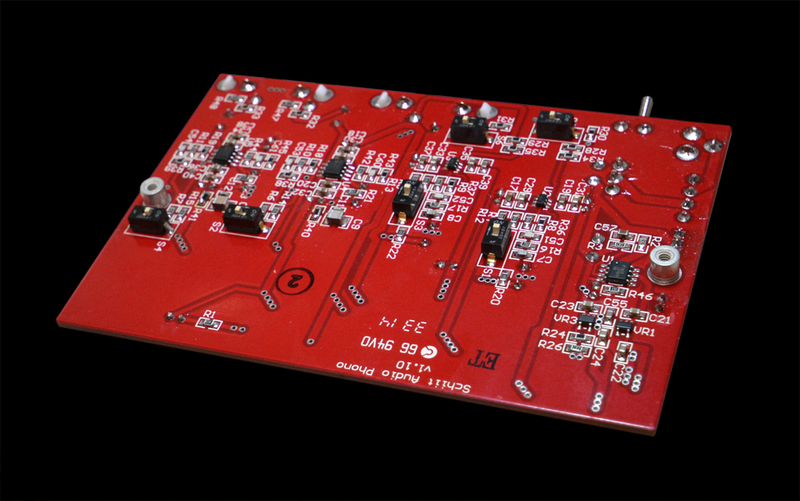 Prepare to rewrite the value equation in phono preamplifiers. 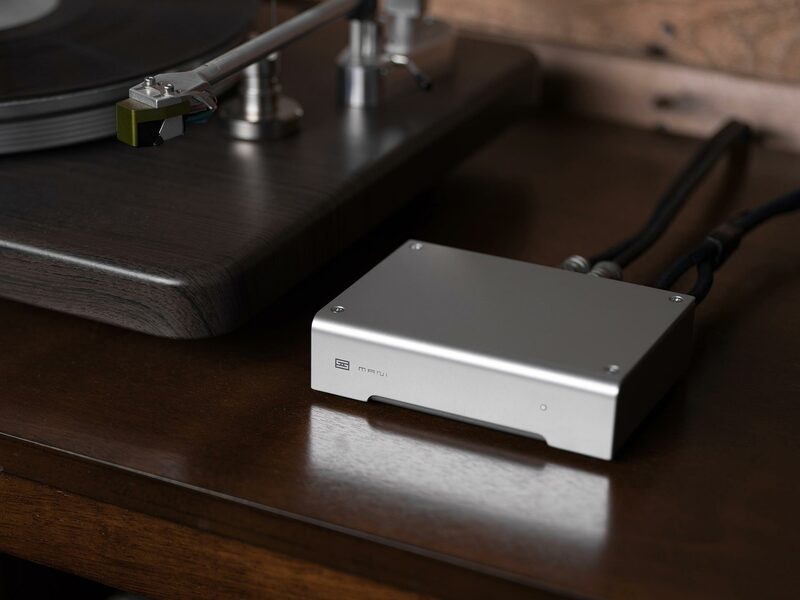 Schiit’s new Mani gives you the flexibility you need for both moving-magnet and moving-coil cartridges, together with exceptionally accurate, low-noise performance—for far less than you’d expect! 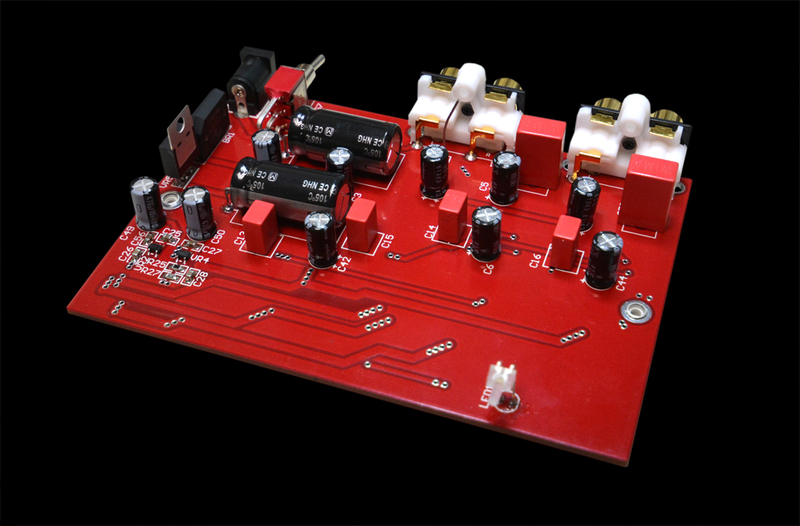 Many low-cost phono preamps are only good for typical moving-magnet (MM) cartridges. They don’t have the gain needed for moving coil (MC), or the flexibility for high-output MM cartridges like Decca, or high-output MC cartridges that that might end up somewhere in the middle of the gain range. Mani, with 4 switchable gain modes, (30, 42, 47, and 59dB) is ready for any cartridge you can throw at it. Mani’s RIAA network is implemented fully passively. What that means is there are no poles in the feedback loop, for more consistent sonic performance. Coupled with precision 2% film capacitors, 0.5% thin-film resistors, and super low-noise gain stages, Mani delivers superb accuracy and performance, even well beyond its modest price. By “designed and assembled in USA" this is what we mean: the vast majority of the total production cost of Mani—chassis, boards, transformers, assembly, etc—goes to US companies manufacturing in the US. Our chassis are made minutes from our facility. Our PCBs are done just over the hill from us, or done in NorCal. Yes, the wall-warts are made in China, but there's some give and take at this price point. Mani is covered by a limited warranty that covers parts and labor for two years. That’s 2x the coverage of most amps in this price range. And, if you don’t like Mani, you can send it back for a refund, minus 15% restocking fee, within 15 days of receiving your amp. Whoa. I didn’t know you guys were into vinyl? Sure! Why not? I mean, it’s not like all the records ever pressed suddenly went up in smoke when CDs first came on the scene. Nor did they slip into an alternate universe when everyone started using iPods. (Both of these events to the great consternation of the recording industry, we’re sure.) Bottom line, there’s a ton of great music out there on vinyl—and today, there’s even more coming. Vinyl is the only physical media that increased in sales the past couple of years, and you may have noticed that more and more bands are releasing their work on vinyl. Well, isn’t that just a passing fad? We don’t think so. Vinyl, played back on an accurate and resolving system, is an amazing-sounding medium. Many audiophiles still prefer the sound of vinyl to digital. We don’t think that will change soon. But even if it does, with Mani, you’re not out big bucks. So who's the nut behind this wheel? Who designed it? You can blame this one on Mike Moffat. Wait, the father of audiophile digital audio is doing analog stuff?!? Yep. Really says something, doesn't it? Isn't that kinda like, well, cross-dressing? Ask Mike about that one. Record the answer and put it on YouTube. Might be fun! Okay, I'll behave. What’s the big deal about Mani? 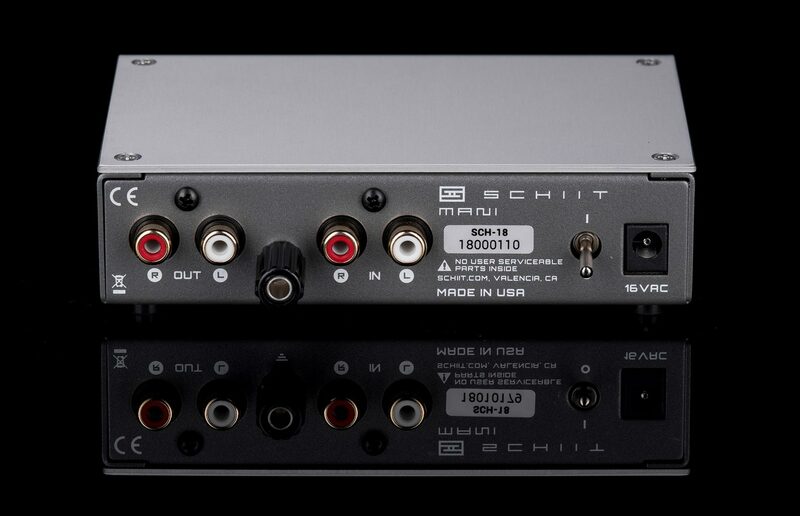 The big deal is that it really blows up the price/performance ratio for small, versatile MM/MC phono preamps—without compromises. Mani’s RIAA stage is fully passive (commonly considered the best way to do RIAA). It uses precision parts throughout, including 2% tolerance film capacitors and 0.5% thin-film resistors. 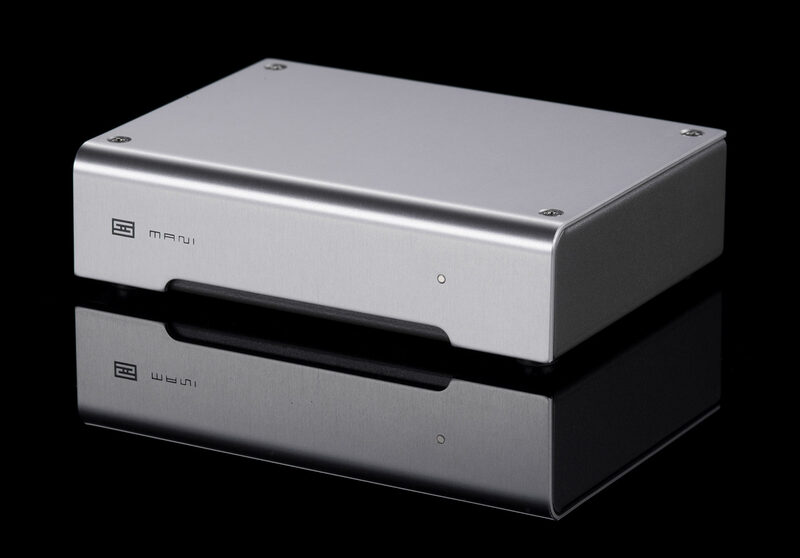 It has great flexibility for both moving coil and moving magnet cartridges—in fact, it’s the only phono preamp anywhere near this price that offers two independently switchable gain stages for four selectable levels of gain. 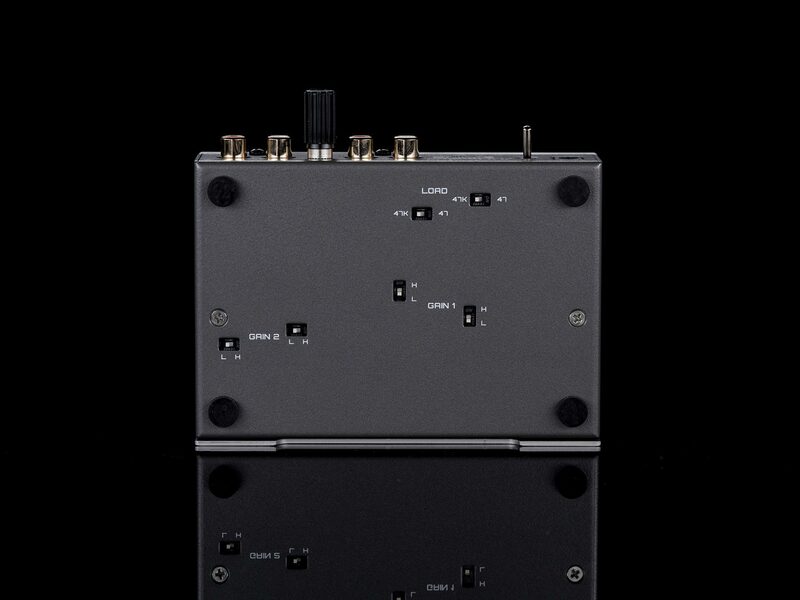 It uses very low-noise gain stages for extremely quiet performance. It has a linear power supply (no switchers here!) with an AC wall-wart off-board for even lower noise. And, it just sounds great! Go ahead and compare Mani to products costing 2-4x more, and we think you’ll come back very, very impressed. I have an inexpensive entry-level turntable with a decent moving-magnet cartridge. Is Mani for me? Absolutely. It will allow you to wring the best performance out of your turntable, and move up the scale to even better performance with higher-end cartridges, if you choose to go there. I have a mid-priced turntable with an MC cartridge I picked up for $250. Is Mani for me? Absolutely. It has all the performance you need until you get into very rarified strata of audiophilia. I have a weird cartridge that’s kinda between an MM and MC in terms of output. Is Mani for me? Yes, Mani has the flexibility you need for high-output MC and low-output MM cartridges, thanks to its four gain levels. I need special custom loading options for my specific cartridge, can you do that? Unfortunately, no. At this price point, we can only build them one way. However, you can consider tweaking it with external loads. Well, you know, I’m very serious about vinyl, I have a $5,000 tube phono stage and a $15,000 turntable with a $2,500 cartridge. Is Mani for me? Wow, you guys are being pretty serious. What happened? We took our pills today. But don’t worry, we’re not going to put Mani up on a pedestal and set up velvet rope barriers and only allow tedious obsessives to listen to it. Mani is still all about having fun with your music. Because if you aren’t having fun with your system, your system is having fun with you! What the hell is a Mani? It means “peanut butter” in Spanish. But, more seriously, Mani is the personification of the moon in Norse mythology. And the moon is round. And records are round. And the night is black. And records are black. Yeah, we’re kinda simple around here. But we do make some decent electronics.